This was a fun and just totally crazy book. It is about people from the future giving people from the past immortality, so the people from the past will work for them. What do the people from the future want these folks to do? Collect rare animals, plants, and other things. The protagonist is a botanist. That is right, a botanist. 1. The premise for this book is crazy fabulous. It felt random but just right. Who knew reading about a cyborg botanist would be so interesting. 2. The protagonist's voice is great. At times, it is almost ticklish. The botanist is fun, assertive, and brave. 1. Sometimes the story felt like it was rambling a bit. I wish that the story had been a bit tighter. 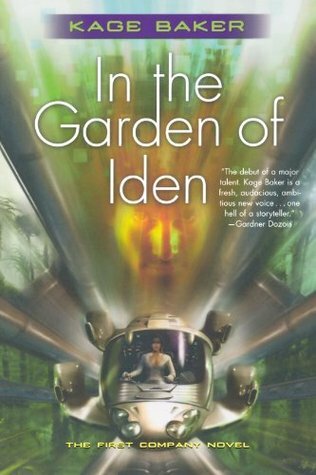 Sign into Goodreads to see if any of your friends have read In the Garden of Iden. 20.0% "I'm reading about a time traveling gardener." 33.0% "Time traveling gardeners have crazy adventures"
50.0% "This is such a strange book..."
89.0% "It's hard being a time traveling cyborg horticulturist."